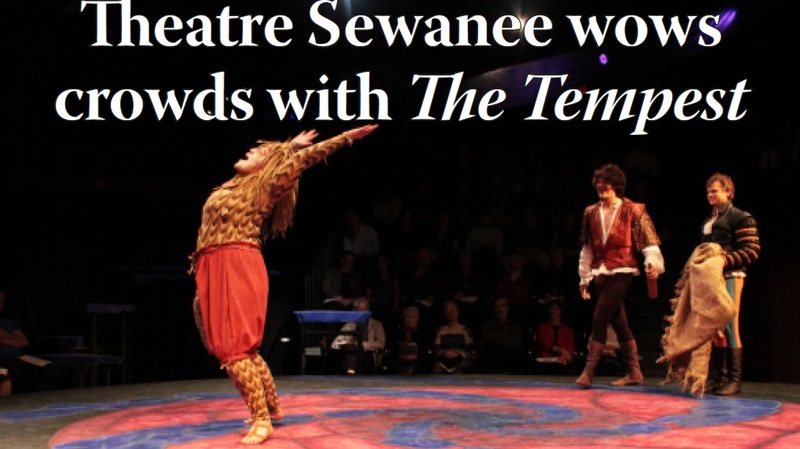 February 26 marked the opening of Theatre Sewanee’s production of The Tempest, directed by David Landon. The show, an adaptation from Shakespeare’s original play, produced a beautiful set, intricate costumes, and some of the best Shakespearean acting seen at Sewanee in a long time. 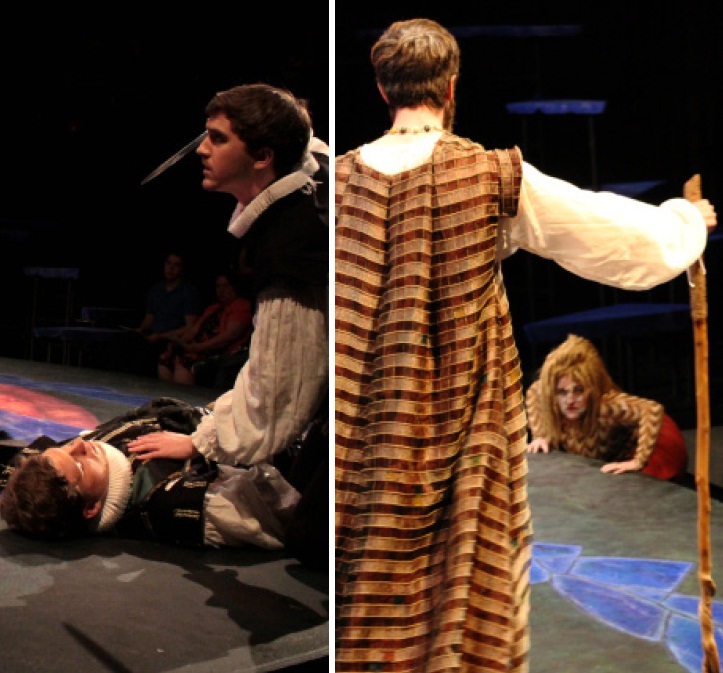 Leading the cast was Chase Brantley (C’15) as Prospero. Carrying a good portion of the play on his back, Brantley portrayed a strong, sensitive, and real Prospero on stage; the scenes between Prospero and Miranda, played by Tia Strickland (C’16), were the most exciting and captivating of the show. The set was designed by Samantha Gribben (C’11), the Design and Production Intern, and Mary Morrison (C’15) acted as paint charge, creating the final product of the stage. “I worked really closely with Gribben to develop all of the paint techniques for both the fabric and the stage floor and platforms which was a trying yet rewarding experience. I also mixed all of the colors. It was a lot of long hours but the end result was worth it,” said Morrison. The production also employed the skills and knowledge of Lily Davenport (C’16) as the dramaturge, and as a last minute actor. As the dramaturge, Davenport researched the show from past performances and literary critiques, and she wrote the explanation in the program to inform the audience of the production’s choices and conceptual meaning. “It was a privilege to work so closely with one of my favorite texts, and to watch how performance and written word informed one another. And I loved having an excuse to dig through lots of footnotes, which have always been one of my favorite literary provenances,” Davenport explained. 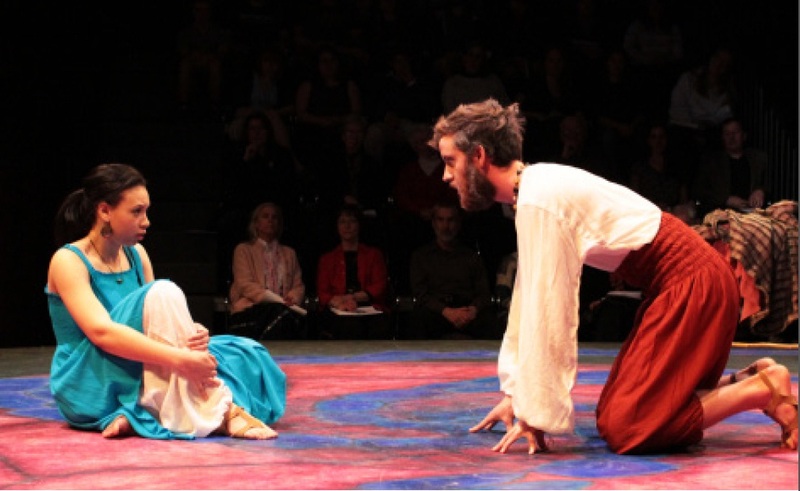 The Tempest ran from February 26 through March 2, and each night had a packed house. Professors, community members, and a large portion of the student body came to see and support their friends and students in the production. Theatre Sewanee’s next production is On the Verge, directed by studentBeckett Scott (C’14), and plays from April 23-27 in the Proctor Hill Theater of the Tennessee Williams Center. Please call or email to make reservations.